We set out Saturday the 22nd of April for a month-long spring trip. Starting point is "Escapade," the semi-annual gathering of members of the Escapees group. Spring Escapade this year is in Chico from April 23-28, and is our first Escapade. We have had one of the wettest years on record in Eureka, and we are hoping that we will get to dry out and warm up a bit on this trip! At the end of the Quartzsite pictures are a few of Sammy, a ginger tabby we picked up there. He belonged to some full-timing RVers, and was reaching a point where an RV could barely hold him. The worst circumstance was that he was terrorizing one of their small dogs. We have a good-sized house with 4 other cats, so we thought we could give him the room to do his thing. Unfortunately he has completely terrorized our oldest cat, and isn't getting along with the other three. We have things worked out by restricting which rooms he is able to get into, but we didn't feel that we could leave him at home without strict supervision, so he is traveling with us. This will be our first "traveling with cat" trip, other than the three days to get home from Quartzsite, so it should be interesting. 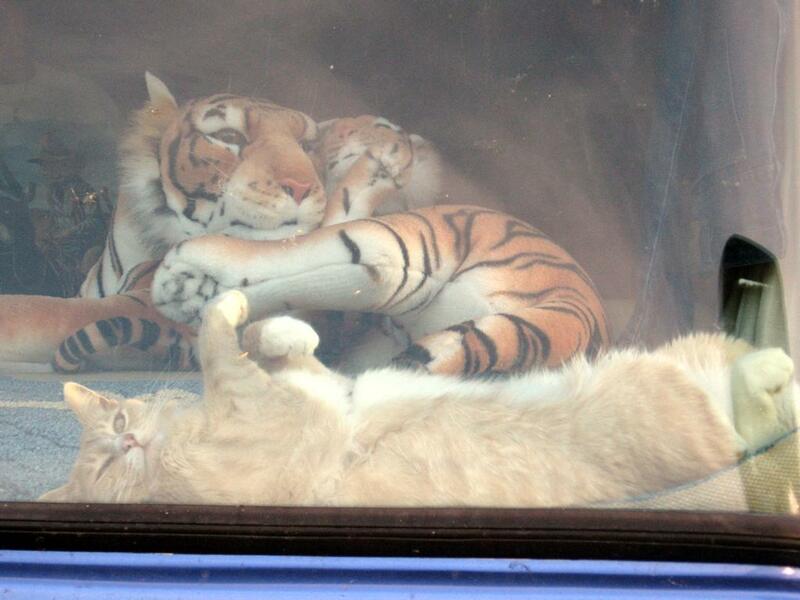 He settled right in - you can see, as he shares the dashboard with the tiger that normally lives there when we are stopped. In Chico while at Escapade Holly swam in Big Chico Creek, we had a couple of gatherings of members of DatastormUsers.com, and we attended the Chico Thursday night Market. We had a few days to kill between Escapade and an appointment for service at the Monaco factory, so we visited Klamath Falls, a place we had not been to before. We did a lot of geocaching, and as a result saw a lot more of the area than would otherwise have been true. After a not-very-productive visit at Monaco, we were heading north from Portland when we learned that the Johnston Ridge observation point at Mount St Helens was opening for the season that day, so we drove up to see it. The weather was great for observing the new dome-building activity that is going on there. We ran into some rain while staying a few days at Bothell, north of Seattle, but we did some more geocaching and visited the La Conner Quilt Museum. The next 3 days were spent with a PNWCO friend in the Vancouver area. One of the geocaches we located was in a nice small botanical garden in Surrey. 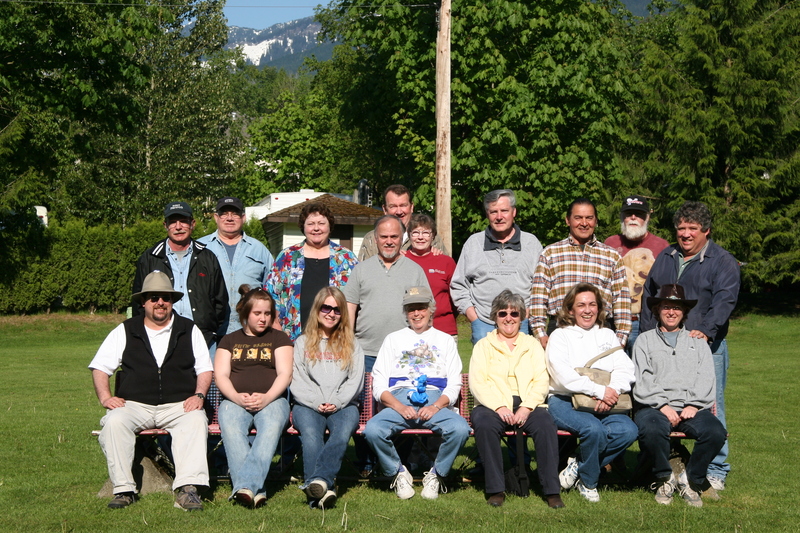 The PNWCO gathering was at an RV park in the shadow of Cheam Peak. The group photo can be downloaded in full camera size (3504x2336, 4.5MB) from this link. Among the places visited while in Chilliwack were the Minter Gardens, and Harrison Hot Springs at Lake Harrison, where there was a sand-sculpture contest in progress. Heading back homeward, we stopped for a few days in Kelso, Washington, and did some geocaching in the Kelso/Longview area. 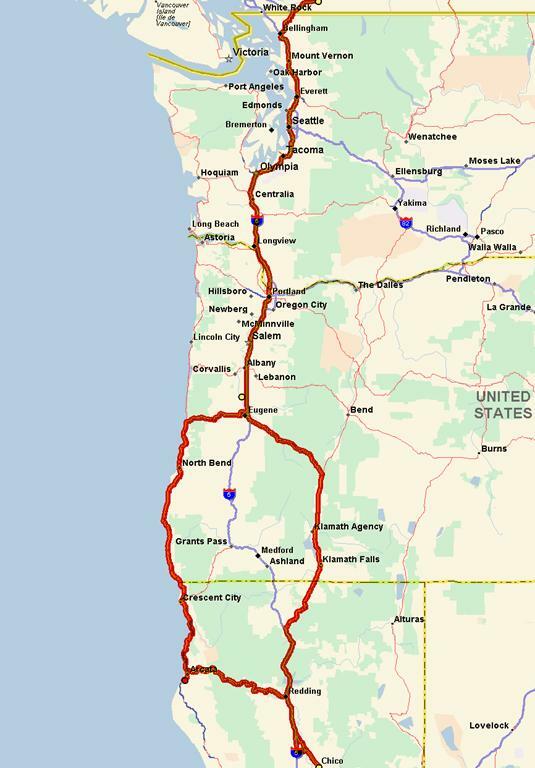 Another stop in Coburg, Oregon. On an RV sales lot next to the park we were staying in was this Safari Zanzibar, the only one we've seen with the same color scheme as ours. It is a slightly longer coach, with a front entrance instead of mid-entry. 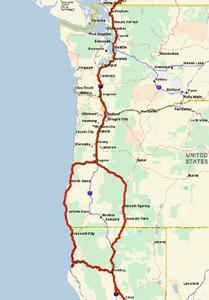 Bandon, Oregon has become a regular stop for us both north and southbound. This time we hit a number of geocaches around town, including one in an old cemetary we would not otherwise have known about, and a few along the rugged coastline. On our last day we stopped for lunch at the port of Brookings Harbor, where we watched a model helicopter flying, and also observed some of the resident cat population in the jetty.